DIY Network wants you sitting pretty in the new year. Two new restoration TV shows will kick off in January: Restored and Maine Cabin Masters. The Restored TV show, starring Brett Waterman premieres on Wednesday, January 11, 2017 at 10:00pm ET/PT. The Maine Cabin Masters TV show, starring Chase Morrill, premieres on Monday, January 9, 2017 at 10:00pm ET/PT. Get the skinny, after the jump. Learn more from this DIY press release. New York [For Immediate Release—December 14, 2016] DIY Network will premiere two new series that showcase the tenacity and mastery required to renovate historic homes. Premiering Wednesday, January 11, at 10 p.m. ET/PT, Restored will star preservationist Brett Waterman as he revives a variety of old homes with fascinating stories to their original luster. In Maine Cabin Masters, premiering on Monday, January 9, at 10 p.m. ET/PT, the series will follow builder Chase Morrill as he teams up with his sister, brother-in-law and best friend to save rundown cabins buried deep in the remote woods of Maine. 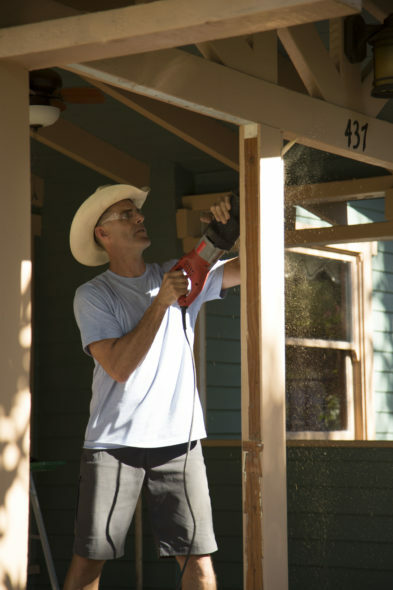 In Restored, Brett will showcase the transformation of character-filled homes gone wrong. He will reveal the unrealized potential hidden beneath neglect, bad renovations and unsightly additions on various home styles including Craftsman, Victorian, Spanish and mid-century modern. During the season of Maine Cabin Masters, Chase and his team travel throughout Maine to restore century-old cottages, lakeside camp cabins and even a cabin on an isolated island in need of major repairs. The episodes will feature the dynamic foursome as they give these dilapidated properties the facelift they have needed for decades. What do you think? How do you like the sound of the Restored and Maine Cabin Masters TV series? Do you plan to check them out when they premiere on DIY? Tell us. More about: DIY TV shows: canceled or renewed?, Maine Cabin Masters, Maine Cabin Masters: canceled or renewed?, Restored, Restored: canceled or renewed? I watch all of Maine Cabin Masters and I watch restored too. Love the idea of renewing old camps and bring them to new life and thinking of all the fun times they can have with there new family members. Are they returning with new episodes? We watch both shows and really enjoy them. Love both… watching reruns so often I know most of the dialog. Stone House Revival and Maine Cabin Masters episodes are never missed. I have watched them so often I know most of the dialog. I just love Stone House Revival, Restored and Maine Cabin Masters! Best shows on right now. I hope they all come back for a new season….. I keep on watching the re-runs! I just love both of those shows and Stone Restoration too! I have been constantly watching re-runs of these shows. Please bring them back for another season! My husband and I love Cabin Masters! I love Maine Cabin Masters & look forward to more new episodes! What they’re doing for these clients’ vacation homes, planning, design, remediation, construction, cleanup, decoration & personalization; are you kidding me? The “Masters” should be charging 5 – 25k more per structure for them to share in profits! Hoping they do one on Sebago Lake. I love, love this show!! I am currently watching both ‘Restored’ and ‘Maine Cabin Masters’, with the latter being my favorite. I record every episode and hope that they stay around for awhile!